Freshwater fishing is done in streams, lakes, ponds, or rivers. Freshwater fishing bait differs from saltwater fishing bait, since the bodies of water are home to different species of fish. Identifying your target species will help you narrow down the right freshwater fishing bait for you. 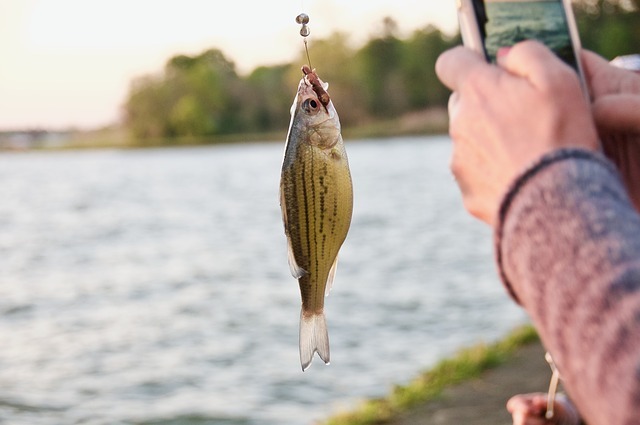 Lots of anglers don’t have a particular fish in mind, so common natural freshwater fishing baits include worms, leeches, insects, and minnows. Whether you need freshwater or saltwater bait, there are a few universal truths to choosing the right bait. Take a look at these four quick tips before visiting your local tackle store. Fish eat worms. They are difficult for freshwater fish to pass up. Worms are an easy meal so most fish species have eaten worms at some point. Readily available at any tackle store, the most difficult thing about choosing worms as your bait is that there are quite a few kinds. Night crawlers or red worms are safe as freshwater bait for nearly any fish. Mealworms will stay on the hook longer than any other worm and they can be used to hook fish, like trout. Fish attracted to scent are great candidates for cut bait. Cut bait is commonly used in saltwater fishing, but freshwater bottom feeder fish are also attracted to this type of bait. Use any caught or bait fish to make cut bait. Seasoned anglers scale the fish but leave the skin on. Big fish eat little fish. This truth is why minnows make great freshwater fishing bait. Trout, pike, stripped bass, and walleyes are just a few of the freshwater fish that will eat minnows. Not only are minnows readily available at your local tackle store, you can easily catch them on your own. Seining will quickly yield the most minnows at the right size for the fish you seek. Insects are another freshwater bait that is available at your tackle store or to catch on your own. Ants, beetles, grasshoppers, and crickets are commonly used to catch freshwater fish, like trout or sunfish. Use insects as freshwater bait during the spring. There is an abundance of insects during this season, so fish are already primed to be on the look-out for them. Leeches are available at your local tackle store and commonly attract fish like the walleye or northern pike. Fish are drawn to leeches’ swimming motion, so make they are used to the water temperature. After they are adjusted to the water temperature they will stretch out and swim naturally. Anglers know that fishing is never a guarantee. Even if you have perfect conditions and the ideal freshwater bait, the fish could just not be biting. Fishing is about the chase, so switch up your bait routine with a different freshwater bait! Fishmaster Pro Tip: Local listings may already have the right freshwater bait picked out for you. Check local listings to make sure the bait you are using is legal. Some lakes may not allow certain baits since they may either starve out bait fish or can become an invasive species. Learn more about freshwater fishing bait here.